Review: 'Hanna' Is Grisly And Gripping Amazon's adaptation of the quirky, dreamlike 2011 film about a young girl trained as the perfect assassin lacks the movie's distinctive visual flair, but it's got a bigger heart. Hanna (Esme Creed-Miles) trains for the day she will have to fight something besides trees. 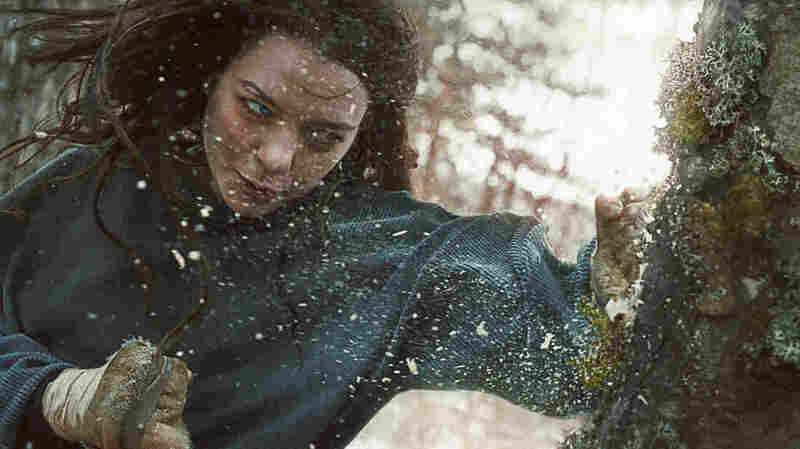 The 2011 art-house actioner Hanna was one odd duck of a flick: part thriller, part coming-of-age tale, studded with propulsive, well-staged fight scenes, standout performances from a coolly evil Cate Blanchett and a then-sixteen-year-old Saoirse Ronan, a driving Chemical Brothers score (remember 2011 you guys? ), a febrile color scheme and a fondness for fairy-tale imagery. Ronan played a young woman who'd been raised as the perfect assassin by her ex-intelligence officer father (Eric Bana) deep in some Nordic forest. When his old bosses finally catch up to them, he and Hanna go on the run — separately. A Big Secret hangs over Hanna's past, because it's that kind of movie, and the girl racks up a serious body count as she travels to Berlin to rendezvous with her father, and uncover said Big Secret. One of the things that make the film so memorable is what happens to Hanna along the way — amid all the fighty-fights and neck-snapping, the film stops dead to allow this teenage girl to ... be a teenage girl. She makes her very first friend (a girl vacationing with her family), goes dancing and makes out with a boy in a surprisingly sweet, gorgeously shot, dreamlike interlude ... and then it's back to the neck-snapping. Director Joe Wright's willingness to switch tones on a dime should have made the film feel choppy and uneven, but the performances and, especially, the striking cinematography lent the proceedings a sturdy backbone so it all cohered, howsoever quirkily. The new eight-episode Amazon series Hanna, based on the film, can't rely on those performances, of course, and lacks the signature, vaguely surreal visual punch of the original, especially in the early going. So what's left? Well, there's that satisfyingly pulpy story, for one. The first episode makes some minor tweaks — the forest in question shifts from Finland to Eastern Europe — but the pilot neatly overlays the film's first reel. The fight choreography is solid and clear — none of that quick-cut Bourne business here — and the violence seems a good deal more grounded and visceral (there's a lot more gunplay, and thus a lot more faceless, hapless armed guards getting bloodily mowed down, than in the film). There's also that same lovely interlude when Hanna gets a friend and enjoys the kind of mundane teenage nonsense her life as a badass-assassin-hermit denied her. The series devotes much more time to it, which turns out to be all to the good, as the friend is question is played by Rhianne Barreto, who's superbly real. It's here that any trace of the original film's feathery, evocative tone falls away; the scenes between Barreto and Esme Creed-Miles, who plays Hanna, are disarmingly intimate, lived-in and natural. Creed-Miles is the best thing about the series; the actor shoulders nearly every scene, and manages to make the taciturn and seemingly affectless Hanna expressive and achingly relatable. She seems as much at home blowing away bad guys as she is hesitantly nibbling her first candy bar, or navigating the thorny emotional landscape of fellow teenagers. If you liked the loopy, discursive and determinedly odd 2011 film, you'll enjoy the series, as long as you're prepared for something a bit more violent, a bit less visually arresting, and — particularly when there's a pause in the bloodletting — a lot more emotional.